The Nova Tablet Arm Chair is just what you have been looking for. The tablet surface features a 360 degree swivel and is large enough to support most laptops, tablets and notebooks. Switch the tablet surface from the left to the right side by inserting it into a cup holder that is inset into both plush arms. The cup holder not in use can double as a pencil, smartphone or glasses holder. Store your books and personal items on a built-in shelf below the seat. Both the shelf and tablet surface come in a rich Java finish. A chrome colored handle in the back of the chair makes for easy mobility. 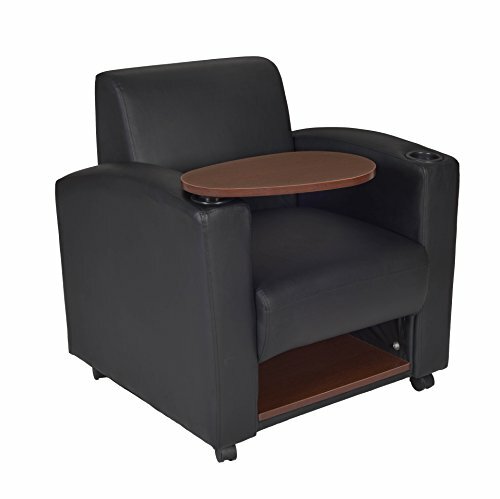 The Nova moves around on 4 sturdy casters that make it perfect for independent and collaborative learning environments. The Nova is backed by a 2 year limited manufacturers warranty.